The causes of bankruptcy vary from person to person, but overall there are trends that reflect the causes of filing at large. Back in the 1970s, credit card debts were less in most people’s financial pictures. And in the 1980s, few bankruptcy filers listed overwhelming medical bills amongst the contributors to their bankruptcy filing. But a recent study published in the American Journal of Medicine found that 62.1% of bankruptcy filings were related to medical debts. Those filing bankruptcy due to medical reasons were on average two years older and more likely to be married than your average filer. Those in medical debt also had more dependents. What does this tell us? Some obvious things off the bat such as older people are more likely to have more medical problems and the more medical issues, often the more unreimbursed medical debt. Married couples and those with children have more family members potentially contributing to the medical debt pool and a sick child or spouse can drive medical debt to unmanageable levels. Lack of college education may be an indicator that the debtor is less likely to hold a job with adequate health benefits. 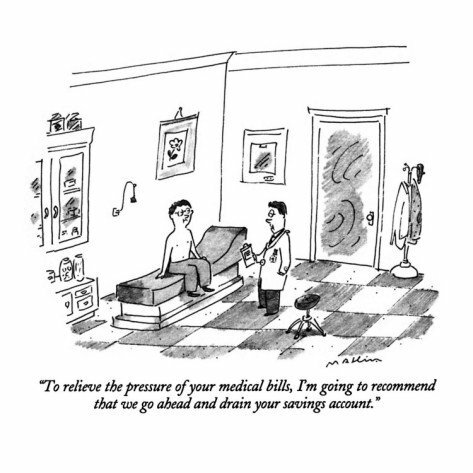 The less insurance coverage you have (or if you have none at all), the higher your out of pocket medical costs will be. And depending on the severity of your illness, even having health insurance may not be a barrier to racking up high out of pocket costs. 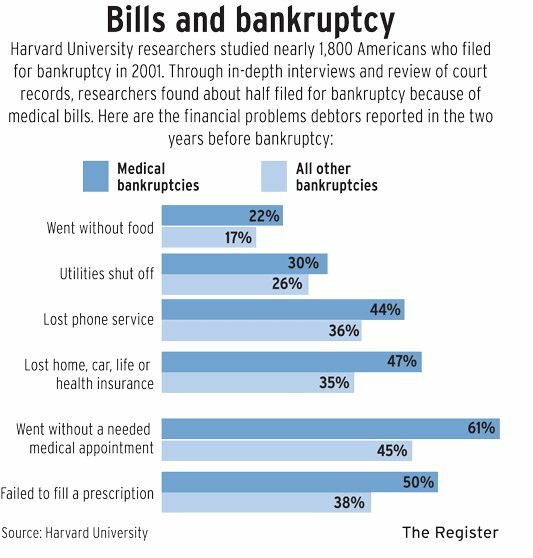 Medical debtors filing bankruptcy were less likely to have a college education, less likely to hold a job they found satisfying and earned thousands less each year than other filers. Among those attributing medical debt as a cause of their bankruptcy, they were 10% more likely to be unemployed or have an unemployed partner than non-medical filers. They were also more likely to be on active duty in the military or have a partner or spouse on active duty. Lack of employment, combined with high medical costs can be indicative of a disability of some sort or just high medical expenses with no insurance to help bear the burden. The lower percentage of those with a college degree can indicate employment in industries or in jobs that may not offer adequate health insurance benefits. And while active duty military often have good health benefits for the soldier, they may not be entirely adequate for family needs. Of those who attributed medical expenses as leading to their bankruptcy, nearly 60% said they had high medical bills, both among those with and without health insurance. Nearly 6% of those owing medical bills and in bankruptcy say they had taken out second mortgages to help pay their medical debts and 7% say they had borrowed money to pay their medical bills. 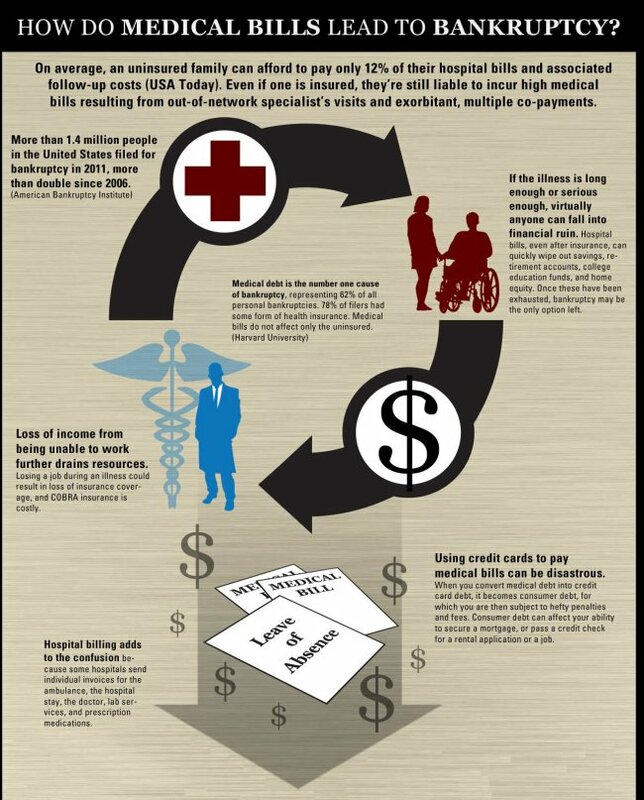 More than 40% of those filing bankruptcy owing to medical debt say they had missed work and lost income due to illness. And 95% of that 40% who had lost income to illness say they had “high” medical bills. Less than 25% of those filing bankruptcy and citing medical expenses as a factor were uninsured – this means that health insurance is not necessarily an adequate barrier between you and medically caused insolvency. Duke University revealed data that out of pocket costs for cancer patients who have insurance averages $1,266 per month! Several months of these costs could wipe out a good portion of your savings and for those without adequate savings, could easily prevent you from choosing between paying other bills or paying for your life-saving medical care. That’s not a choice anyone should have to make. What also seems to be a significant contributor is lapse in coverage. Of those filing for bankruptcy and counting medical bills as a contributor, 40% of filers say they had a lapse in coverage during the two years prior to filing. For those with ongoing illnesses, it seems that lack of coverage can be financially debilitating. Until we have meaningful health care reform that will help avoid lapses in coverage and tackle of high costs of health care for those with and without insurance, this will continue to be an issue. If you are in deep financial debt owing to a backlog of medical bills or time lost from work due to an illness, Chapter 7 bankruptcy can get you a clean slate and help you get your finances back on track. For financial peace of mind, contact us to discuss your options today.